Janey Moffatt is an arts educator and community artist who studied Art at West Dean College and English Literature at Leeds University. She fuses fine art with craft techniques for her work at The Craftimation Factory, an arts charity that she established with her mother in 2013. It is an award winning organisation that brings art activities to everyone, especially those who might face barriers. Moffatt is a contemporary mixed-media artist who combines fabric, paper and stitch with drawing, painting and mark-making. She was deeply affected by her youth spent growing up in the Troubles of Northern Ireland, and as a result explores conflict, oppression and resolution in her work; looking at how imbalances of power influence our relationships with ourselves, each other and the space we occupy. Janey uses motifs that echo the symbolism of her childhood; guns and the piercing eyes of Irish politicians feature often. Sometimes the exploration of contention is through a global lens of war; at others that of a deeply personal battle within the individual. Moffatt’s work is informed by her study of literature and regularly features words and snippets of poetry. These are embroidered into textile and paper substrates that have been worked using a variety of techniques including natural dyeing, painting and printing. 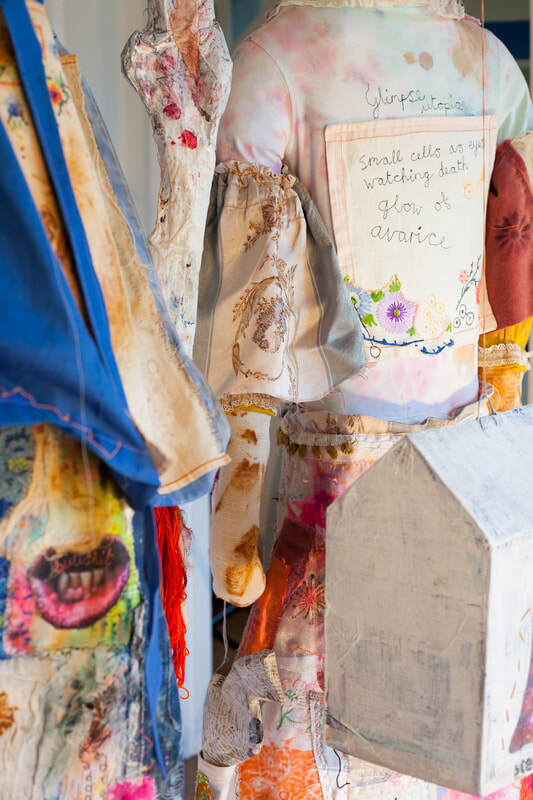 To address her concerns around sustainable practice and our ever tenuous place within the natural world, Janey uses mainly recycled and salvaged textiles; often these pieces have a story attached to them and she feels compelled to extract the infused meaning, usually to process and provide an understanding of the events of her own life. Janey views the whole of her life as an artist's residency; drawing deeply from the rich resources of her own mental health experiences and her ongoing journey through matrescence. You can find out more about this on the page 'Give My Head Peace'. Janey is the founder of The Craftimation Factory; an award winning Charitable Incorporated Organisation created by herself and her mother after years of enjoying knitting and craft together. The organisation's aim is to bring creativity and joy to all, but especially those who might not otherwise be able to access it. The Craftimation Factory is governed by a board of four trustees. ​"In the two years that I worked with Janey she stood out as a key player with plenty of energy, a keen eye for detail, the ability to multi-task and excellent project management skills - always quickly grasping creative concepts and how they needed to be delivered. When she returned to the UK, there was a real void in her role that we have never been able to fill. She is a real asset, a pleasure to work with and comes highly recommended."